One of the prominent trends in 2017 was an increase in short-burst attacks, which have become more complex, more frequent and longer in duration. Burst tactics are typically used against gaming websites and service providers due to their sensitivity to service availability as well as their inability to sustain such attack maneuvers. Timely or random bursts of high traffic rates over a period of days or even weeks can leave the targeted organization with no time to respond—causing a severe service disruption. What do these findings mean for you? Provider: What is a burst attack? Your provider has no clue what a burst attack is, but at least he is honest. Send him Radware’s 2018 ERT report or Cisco’s 2018 annual cyber-security report. Provider: Yes, we also protect against burst attacks. Your provider has no clue what a burst attack is. Send him Radware’s 2018 ERT report and switch your provider. Keep with your DDOS mitigation provider. You are in good hands. 42% of organizations suffered DDoS attacks in recurring bursts. These attacks lasted no more than a few minutes for most victims. This information and more about IoT driven DDoS attacks can be found in Cisco’s Annual Cyber Security Report (ACR) 2018. 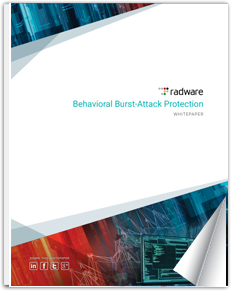 Radware contributed to Cisco’s 2018 ACR, discussing DDoS attack trends, the threat of IoT botnets and theexpansion of burst attacks and reflection amplification attack techniques. Ron Meyran leads the marketing activities, partner strategy and Go-to-Market plans for Radware’s alliance and application partners. He also works to develop joint solutions that add value proposition and help drive sales initiatives – designed to increase visibility and lead generation. Mr. Meyran is a security and SDN industry expert who represents Radware at various industry events and training sessions. His thought leadership and opinion pieces have been widely published in leading IT & security industry magazines and he holds a B.Sc. degree in Electrical Engineering from Ben-Gurion University and a MBA from Tel Aviv University. That the awesome place and i really impressed to read it.